Living in Dallas, Houston, Fort Worth, or the surrounding areas, comes with plenty of benefits. The cities offer a variety of fun and family-friendly activities as well as neighborhoods with diverse amenities, such as walking distance to retail areas, local parks, and more. Because of this, rent prices have continued to climb, which means more people are looking for ways to save money. If you’re looking to reduce your costs and save money on rent, consider a storage unit to cut costs. 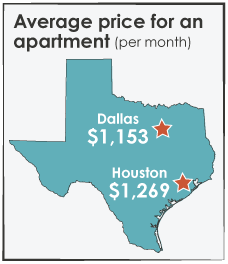 According to rental market trends, the average price for a Dallas apartment is $1,153 per month and and about $1,269 per month in Houston. For many, these monthly costs can be substantial, especially when tacking on utilities, transportation costs, childcare, and food. This is where a storage unit can be incredibly beneficial. Taking advantage of affordable self-storage means you may be able to rent a smaller, less expensive apartment. The example below breaks it down. If you compare a one-bedroom apartment in Houston to a 10’x10’ storage unit rental, you could have more cash in your pocket each month. When it comes to choosing your apartment, carefully consider your monthly rent, the amenities or utilities included, and the length of your lease. Many apartment complexes offer garages and storage units, but they may be an additional cost, increasing the amount owed each month. Why pay extra when you could choose from a wide variety of storage units to fit your exact storage purposes? A self-storage unit requires little to no maintenance and is a convenient way to store belongings that could otherwise crowd a smaller apartment. 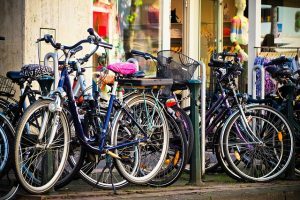 If you’re looking at apartments that don’t offer enough space for bikes, keepsakes, holiday décor, or other seasonal items, rethink what items you need to have with you all the time. If you have furniture items, like a special heirloom piece or another item you plan on using later down the road, that you just can’t fit into your current apartment, then a storage unit is a great idea. If you’re not sure where to begin, start by making a list of items you need to store. Be sure to include item measurements where appropriate (tents, large pieces of furniture, etc.). Storage units range in size, varying from 5’x5’ (smallest) to 10’x30’ (largest). Regardless of what you need to store, you should be able to a unit that suits your needs perfectly. Maybe all you need is an area to store a family car, work truck, or a boat or RV. There are various sizes available for those, too.